Our changelog lists some of the changes we’ve made so far, and the work is still ongoing! In this post, we’ll look closer into some of the improvements we’ve made. The new salecalc.com start page. 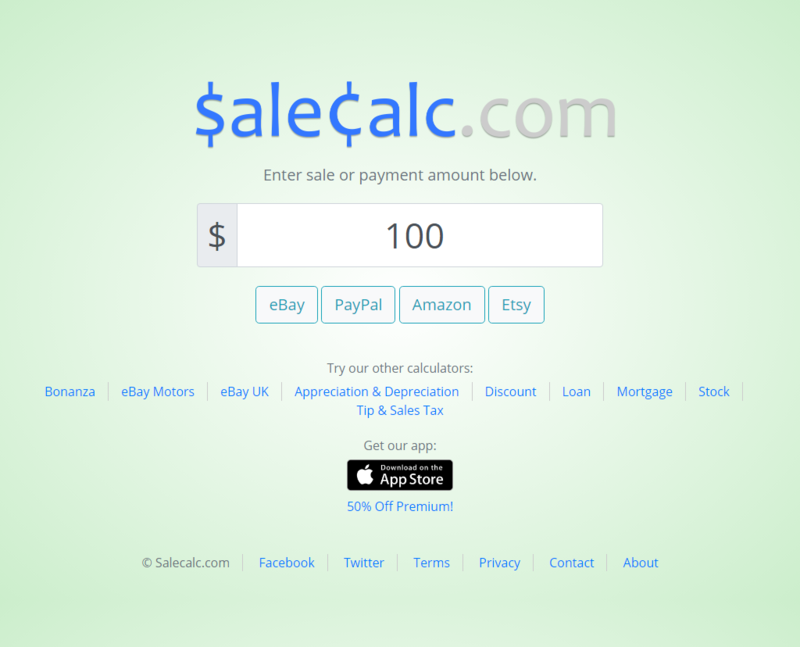 Instead of the salecalc.com home page being our eBay profit calculator, we’ve introduced a brand new start page from which all your salecalc.com calculations can begin. Enter an optional payment or sale price amount, then choose a calculator! The chosen calculator will launch with the results for your specified payment or sale price, or with fresh defaults if no amount was entered. Viewing Amazon fee calculator results launched from the start page. 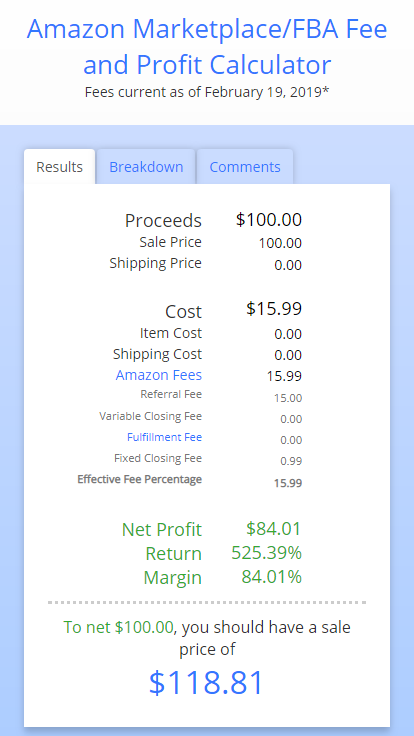 If you launch the Amazon fee calculator with a start page value of 100, for example, it will load with the sale price field set to $100, and the desired net profit field also set to $100. The calculator’s results will show the overall breakdown based on these pre-filled and default settings. The sale price required to achieve the desired net profit of $100 will be shown as well. Other calculators are launched in a similar way that make sense for the calculator. The PayPal fee calculator, for example, will launch with the fees displayed as if the entered start page value is a PayPal payment, or start fresh if no amount was provided. 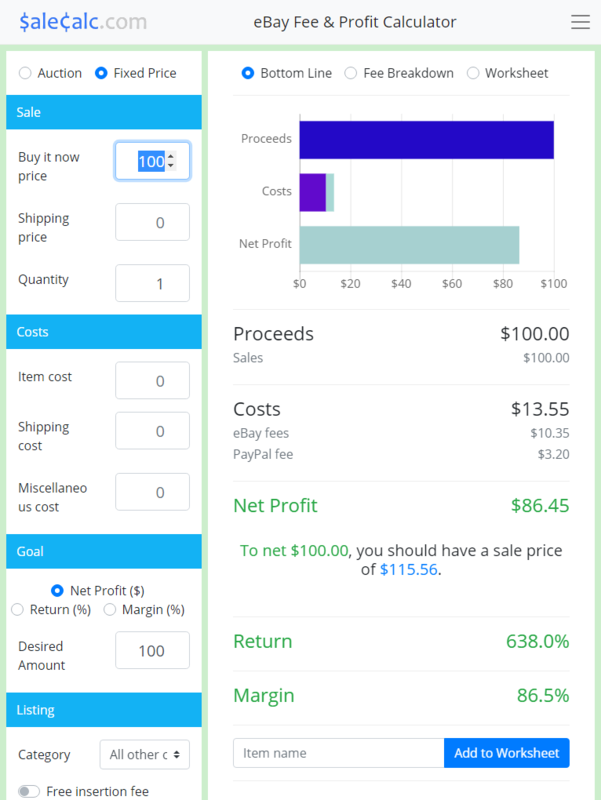 Whether you launch a calculator with a value from the start page or with a blank value, you can adjust any of the calculator’s settings, such as item costs, at any time. The online eBay fee calculator is inspired by our iOS app’s interface. In the latest edition of our online eBay calculator we combine the strengths of and learnings from our desktop, mobile, and app versions of our eBay calculators. Users of our iOS app will find the interface of the new online calculator to be very familiar, while users of our classic version will notice the snappiness of the real time calculations and smooth chart animations as calculator values are entered. The mortgage payment calculator breaks down the costs to owning a home, and can help plan out how to payoff a mortgage early. There are many costs involved with owning a home. Our new mortgage calculator breaks down many of the details for you–from the payments made monthly to the grand total cost by the time a home mortgage is paid off. The mortgage calculator can quickly produce an amortization table for your mortgage with a customizable start day–in the past or in the future. 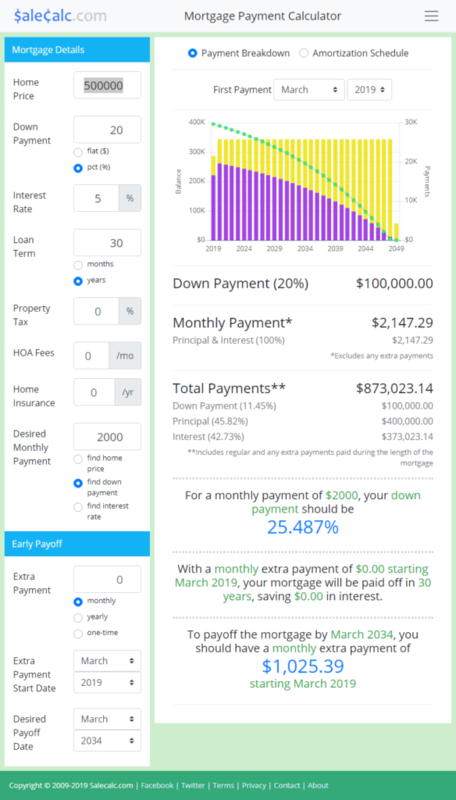 New to the calculator is an early payoff section, which allows you to plan out extra payments to shorten the length of a mortgage. If you instead, want to target a specific early payoff date, the calculator will show you the one-time, monthly, or yearly extra payment required to meet that date. The extra payments can be set to start at any time during the mortgage period and the calculator will account for that. Just like our eBay calculator, the mortgage calculator visualizes results with a colorful chart that animates in real time as settings are entered. Don’t like the colors in the chart? Then refresh the page in your web browser, and the chart will get a brand new set of colors with your numbers intact! We like to keep it simple with the PayPal fee calculator. Our new PayPal fee calculator keeps the ease-of-use of our previous version, but with a cleaner look and feel. It is also much more lightweight than our last version. Having current PayPal fee rates in the calculator across the many countries and regions that PayPal supports is an ever moving target. To help with that cause, we’ve included a link in the calculator’s footer for fee rate update requests. The link launches a Google form where the PayPal fee rate information can be entered. When requesting a new or updated fee rate, include all fields so that we can get the calculator updated as soon as we can! Thanks for taking the time to learn about our Salecalc.com 3.0 refresh. This post details just some of the progress we’ve made so far, and we aren’t finished yet! This entry was posted in News and tagged ebay, mortgage, paypal, refresh, start, user interface on March 30, 2019 by salecalc.com.